Update: Activision has officially announced Call of Duty: Advanced Warfare. Check out the first trailer now. Original article: Activision is about to reveal the next Call of Duty. They're counting down to an official announcement just a few days away. The teaser site has a countdown on the top. It will end on Sunday, May 4th at 10 AM CST. Presumably we'll get to see the first trailer for Call of Duty 2014 at that time. The title for the site is "Get Ready for a New Era of Call of Duty," suggesting a brand-new storyline. The distorted image on the website, presumably of a soldier, contains a few links. The first is to a Wikipedia entry on private military companies. The next is a list of New York Times articles on PMC's and mercenaries. The last link is a Business Insider article about Erik Prince, founder of prominent PMC Blackwater. This not-so-subtly suggests that mercenaries are at the heart of Call of Duty 2014's plot. Call of Duty 2014 will be the cover story for the next issue of Game Informer as well. They'll be revealing the cover image for the issue when Activision's countdown runs out. The magazine also plans to share a few details on the shooter as well. 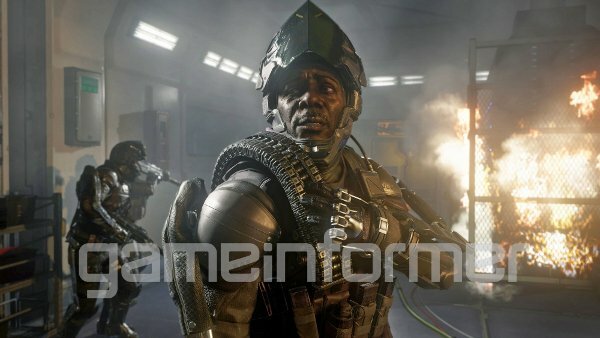 Our first look at the upcoming Call of Duty actually came last week with an in-engine shot of one of the characters. It was merely a close-up on a face, though, so it didn't tell us much of anything about the project. GI unveiled a full-fledged screenshot for the game as part of their announcement today. The image shows soldiers wearing futuristic armor. It's currently unclear how far into the future we'll be going with this new COD, though. The image is called "Blacksmith." Presumably that's a codename for the project but the term may have some significance in the plot as well. If you want to see all the fine details, check out the full size image at Game Informer's site. Call of Duty 2014 is being developed by Sledgehammer Games. The studio, founded in 2009, previously helped Infinity Ward finish Modern Warfare 3. Before being retasked to MW3, though, they had been creating a third-person shooter spin-off for Call of Duty. That project was rumored to be futuristic. Is Call of Duty 2014 the game they had first set out to make in 2009?